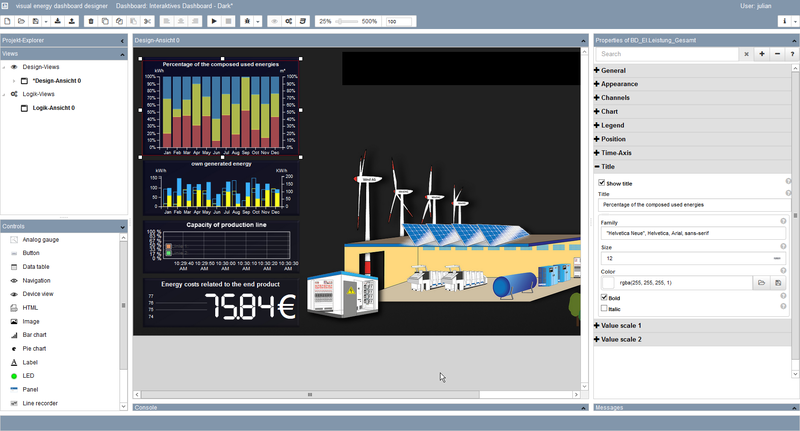 The Dashboard-Designer is a separate application, which is online and free for visual energy costumers. The creator of a site has to be a member of the User role ‘PM’. The PC has to be reachable for the visual energy application as well as the Designer-Toll at https://designer.visualenergy.de . The forwarding from the visual energy application is automatically. In the background, the project-information be sent to the Dashboard-Designer, for using this in the Dashboard. Energy data never be transmitted! All used graphics, references and scripts were compressed and stored in the respective Project. The viewer of a Dashboard must never have connection to the Designer at every time. We propose, for examples and for getting know the using, our videos in our media library.